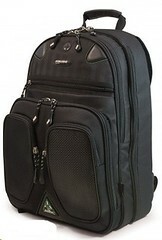 I just posted a review of the ScanFast Element Briefcase from Mobile Edge over on my Squidoo lens. Coincidentally, I just received this review of its predecessor, the Element Briefcase, from creative colleage Lisa Penz of White Raven Creative. The original Element is still being sold by Mobile Edge (though not in the pink), but the ScanFast is the newer model. Lisa's comments pertain to both models, I think. Enjoy! I recently retired my laptop backpack for an over the shoulder Mobile Edge laptop bag. As the creative director for my agency White Raven Creative, I have a very hectic schedule which demands me to be in various places in a short time span while wearing many different hats so to speak. I soon realized that my backpack wasn’t working for me and I was in dire need of a multipurpose laptop bag to support my ultra busy lifestyle of work and social engagements. I determined that my main criteria in finding a new laptop bag was both functionality and versatility. It was also critical for me that my bag be easily transportable while maintaining aesthetic appeal and a professional appearance. Kate recommended the Mobile Edge bag for me. 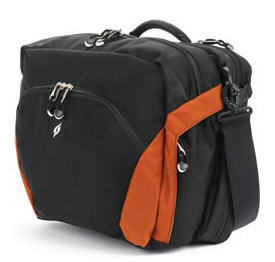 The Mobile Edge bag is a Special Edition over the shoulder laptop bag that is durable and high-quality which gives me the piece of mind that my Macbook is well protected while I travel from meeting to meeting. 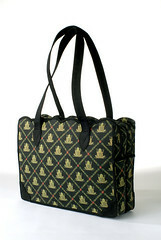 I really like this laptop bag because it is very suitable to my style and resonates with my personality. The exterior of the bag is very professional looking which juxtaposes it’s unique colour combination of dark brown leather with complimentary pink suede features. To add to the element of fun - the sleek, fabric interior has a funky striped pattern. This playful looking interior is also abounding with compartments to the utmost detail. There is even a pocket for my Passport! Talk about thinking of everything. I really look forward to taking this laptop bag inflight! The downsides to this bag are few. I would say the bag is quite a large size in relation to my body. As I am 5’4” - this bag may not be the ideal size for someone my height. Also, with loads of compartments and ample padding comes weight. This bag is not light! It becomes very heavy after carrying it around town. I’ve been using the Mobile Edge bag for a few weeks now and I am receiving many compliments wherever I go. It seems to attract many different people (especially women... they say the love the style and the pink!). Thanks Kate! Thanks, Lisa! You can see the full Element line over at Mobile Edge; it retails starting at $89 USD. As I mentioned in an earlier post, we're starting to see the checkpoint friendly bags emerge from laptop bag designers. 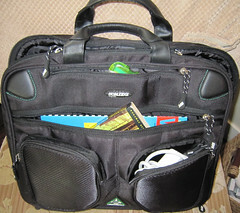 I just posted a bit about the one from Tom Bihn over on my Squidoo lens. I think his tri-fold design is pretty darn clever! Get the details about the Checkpoint Flyer over on Squidoo. Bonus Link: Article on Aviation Week about the TSA friendly bags in which I am quoted. Cool!